I want to start of this post by saying that I do not believe I am a fashionista! I don’t really think I have a particular style. I like to buy things that I think can work well with things I already have. I love searching my closet and matching old and new items. I love to bargain shop but also save up for a “big purchase”! My most recent “ah-ha” piece I found after pinning some similar outfit styles on my Pinterest page. 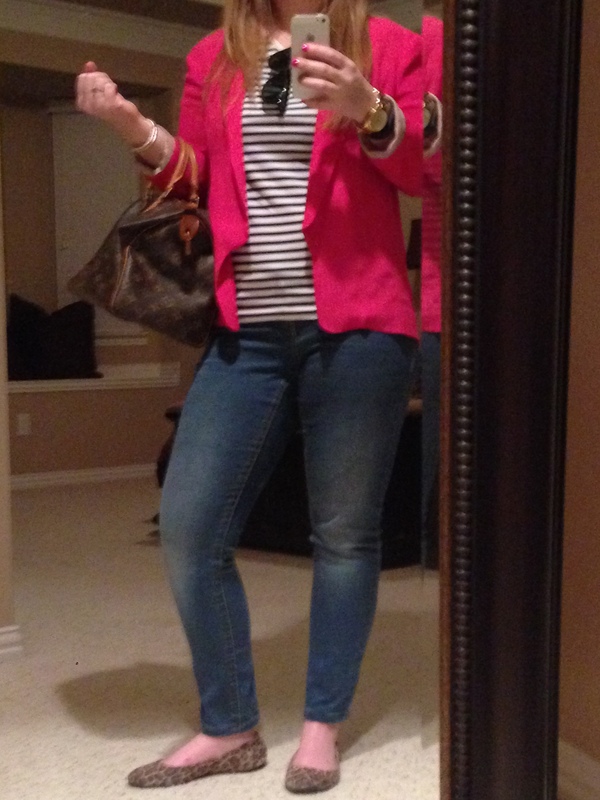 Bold bright colors seem to be popular so I wanted to create a new out fit with a fabulous hot pink blazer I had. FUN FACT: I am finally venturing on mixing and matching pattens so I matched my leopard flats (leopard is basically a natural anyways) with my striped T.
Most of my jewelry are staple pieces that I wear most days. However in the future you will see a lot of my outfits I like to incorporate fun statement necklaces or scarves!